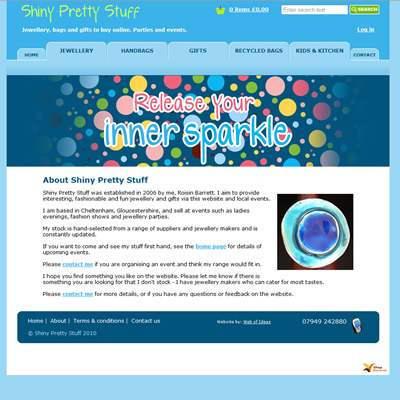 Interesting, fashionable and fun products from Shiny Pretty Stuff. 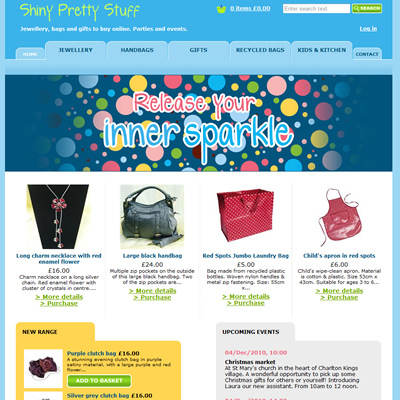 This website sells jewellery, handbags, gifts and kids stuff. 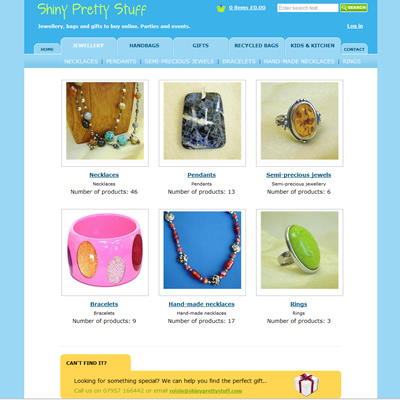 Stock is hand-selected from a range of suppliers and jewellery makers and is constantly updated. Visit their jewellery store online. Web of Ideas worked closely with the customer to design and build a website that correctly represents their brand and ethos. Advanced SEO (search engine optimisation) features such as unique and meaningful URL's (website addresses) for each product. Online credit and debit card processing. Pay by PayPal or cheque in post as an alternative to online card payment. Comprehensive reporting on sales, abandoned carts, etc.. All reports downloadable as a spreadsheet. Product search with sorting by relevance, price, name. Easy extracts for integration with ebay and shopping comparison websites. Price discounts, voucher codes and gift vouchers. Option to have items gift wrapped with a card and sent to a friend or relative. Fully content-managed website so, for example, 'upcoming events' can be easily updated.